Methodist Church Nigeria developed from Wesleyan Methodist mission Outreach of Methodist Church in Britain in 1845 and Primitive Methodist Mission via Fernando Po. The merger of the two Methodist Churches formed Methodist Church Nigeria. Methodist Church Nigeria is currently a Connexional Episcopal Church headed by a Prelate. The Conference Area is divided into 16 Archdioceses, 1 Council and 74 Dioceses mostly located in the rural areas. The membership size is about 2 million full members. The Nigeria Annual Conference of the United Methodist Church, separated into two halves by the River Benue, is located in the Northeastern part of Nigeria. It attained Conference status in 1992 and has its own resident bishop. The headquarters is in Jalingo, capital of the new Tabara State of Nigeria. The first foundation for mission in Muri was laid in September, 1906, when the Reverend Dr. C. W. Guinter of the Evangelical church, a forerunner of the Evangelical United Brethren (EUB) traveled up the Benue River to Ibi near Wukari. Guinter had come from the United States with four other missionaries to work for Jesus Christ in the Sudan – a region extending across Northern Africa, south of the Sahara. In 1946, the Evangelical church became part of the newly merged Evangelical United Brethren (EUB). Mean while, the British Methodists were having trouble in staffing and financing their mission work in Nigeria while still recovering from World War II. So in 1947, the British missions on the southern side of the Benue River were merged with those of the EUB on the northern side. From 1923 until 1954, the EUB Church in Nigeria had been run by the Missionary Council. In 1954, it became the Muri Regional Church Council. The foreign missionaries were brought under the same Church Council as the indigenous Nigerians. In 1954, the first indigenous leaders were elected. After pastoral training, the first ordinations of Nigerians took place in 1958 and 1964. Four district churches were also created in 1964, two on each side of the river. Today there are 15 districts and 180 charges. Bishop Arthur F. Kulah of the Liberia Annual Conference was appointed as Itinerant Bishop to Nigeria from 1984 to 1988. In 1989, he was replaced by Bishop Thomas S. Bangura of the Sierra Leone Annual Conference. Finally, in May 1992, Nigeria became a full Annual Conference, and on August 14, Dr. Done Peter Dabale was elected as its first Resident Bishop. In 1989, the church established its theological seminary at Banyam to prepare students for ministerial work and degree programs at other theological seminaries. 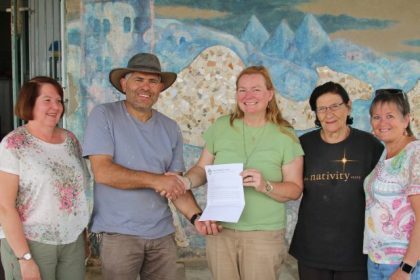 The Kakulu Bible Institute in Zing and the Didango Bible School met our demands of evangelists. An evangelical program in our Church is at work establishing new churches and directing annual workshops and courses for the clergy and evangelists. The church sponsors programs in agriculture, rural health, rural development, women’s work, youth and aviation. We have been able to work harmoniously both at home and abroad for the success of church growth and development in Nigeria.